Below is a list of some of the blogs and resources that we find helpful in thinking about data and design. Nathan Yau's explores how others use visualisation techniques to analysis and understand data through his blog Flowing Data. He has written two books on the subject and he offers good and easy to follow hands-on tutorials. David McCandless and his team on Information is Beautiful create visualisations and write books on the subject. Visualising Data is a project by Andy Kirk and is a great place to read about current research, trends and projects in the data visualisation world. Information Aesthetics (run by Andrew Vande Moere) collects projects that represents data or information in original or intriguing ways. Eager Eyes is a website where Robert Kosara reflects on new developments in the field of visual communication of data. 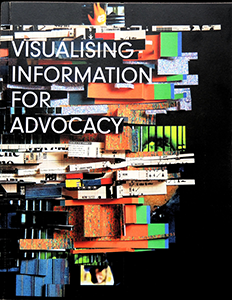 The Functional Art by Alberto Cairo is a key text on information graphics and on his website he discusses his work and developments in the field. Scott Murray created a great reading list of books, blogs and essays centered around the processes of data visualisation. Data Stories is a bi-weeky podcast on data visualisation hosted by Enrico Bertini and Moritz Stefaner and complimented by their, often wonderful, guests. Data Therapy by Rahul Bhargava from MIT Centre for Civic Media shares processes, tools and tutorials on presenting and sharing your data in creative ways. If you're interested in mapping complex networks then Manuel Lima's Visual Complexity is a good place to start. Have a look at Data + Design, a free e-book that explains important data concepts in fairly simple language created by Infoactive and the Donald W. Reynolds Journalism Institute along with 50 volunteers. Data Journalism Handbook is an open-source reference book for those interested in data journalism. This was a collaborative effort that involved dozens of data journalism's leading advocates and best practitioners. The Numbers is produced by The Wall Street Journal and examines the way numbers are used, and abused. GeoJournalism is the practice of telling stories with data generated by the Earth Science and the GeoJournalism handbook is a helpful online toolkit that can be applied across various sectors. Journalism in the age of data is a video report by Stanford on data visualisation as a storytelling medium. A gentle introduction to exploring your data is an online course created by Tactical Technology Collective for the School of Data that provides an introduction to spreadsheets and pivot tables. A gentle introduction to cleaning data is an online course created by Tactical Technology Collective that will guide you through reducing errors by cleaning data. This guide by MapBox walks you through preparing data with google docs. ColorBrewer has been designed to be a diagnostic tool for evaluating the robustness of individual colour schemes, features also include colour blind safe schemes. Colour Code is an online designer tool that allows the user to easily and intuitively combine colours.